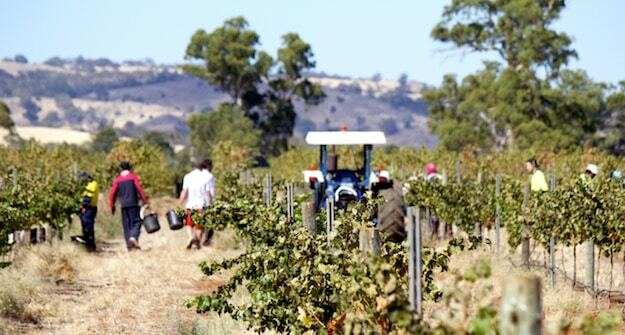 Vintage 2008: By now most people would have read the many and varied reports on the just past 2008 vintage, and I thought I would take this chance to give you my perspective on the Barossa Valley vintage. If a single word were to be used it would be HOT! however, this would probably not be a strong enough descriptor, perhaps Bloody HOT is more suitable. Then throw in frustrating, quick, one of a kind, well you get the picture. The very best news is that I believe the Shiraz fruit that I have taken in this vintage is a good as I have ever seen, the Grenache and Mataro are extremely solid, and the Petite Verdot & Malbec handled the heat a treat. I was also very fortunate to gain the winemaking services of Nigel Dolan ex Saltram No 1, Eighth Maker, Mamre Brook etc, for this vintage as a consultant and his experience in a tough year was invaluable. Bottling of the 2006 wines has commenced and I look forward to promoting these wines to you in 12 months time. Kurtz Family 2005 Boundary Row Shiraz; Bouquet shows a great expression of bright Shiraz fruit with plum, sweet vanilla, floral notes, and spice. Silky, dusty tannins combine with pure fruit to form an ample-weight wine with a supple consistency, and an agreeable complexity. Blackberry, violets, plum and chocolate flavours, together with loads of dried herbs, finish slightly sour but with good length. It’s approachable now, but will probably reach its peak drinking window around 2012. Rated as Recommended with **** for value. Kurtz Family 2005 GSM; 60% 25% 15% the wine is sealed under cork. The bouquet shows sweet blackberry notes with vanilla and charcuterie below, and with hints of milk chocolate, it’s attractive. A well-made, clean, solidly balanced wine that is driven by pure fruit, and backed by silky, chalky tannins, it’s medium-weight with a supple consistency, and has a diverse, harmonious complexity. This is a cuddly wine that is easy-drinking, will go well with food, and shows some restraint. Flavours of blackberry, black cherry, plum, dark chocolate and mint have a meaty, spicy finish. Rated as Recommended with ***** for value, you would be crazy to miss it. Kurtz Family 2005 Seven Sleepers; The bouquet is fruit driven, showing diverse aromatics with varietal Cabernet notes, plums, vanilla and chocolate. On the palate, the bright fruit is shouting for attention, with cocoa, plum, blackcurrant, vanilla and chocolate flavours that finish clean. With enough dusty tannin to hold the wine together, there may not be a lot on the back palate, but it has loads of flavour to compensate. Medium-weight with a supple consistency and short structure, this is a very-easy drinking wine with tons of fruit for the dollar. Drink over the next three years; it is rated as Acceptable with ***** for value. At this price point, quaffing wines don’t come any better! Previous Vintage Wine: Limited stock is available. Kurtz Family 2003 Lunar Block Shiraz; The bouquet shows cloves, blackberry and coffee, so there is a fair amount of oak influence, but less than in previous years. Fine, powdery and drying tannins combine with fresh, lively acid and pure fruit to produce an ample-weight, well balanced wine with supple consistency, solid structure and agreeable complexity. Clove, plum, black cherry, a minor amount of dried herbs, and slightly green tannins, (which are no doubt a product of the vintage); the wine finishes with good length and is a good result from a difficult vintage. A Grenache, Shiraz & Mourvedre blend from the Barossa that is right on the money. Deep lightly spicy, dark fruit flavours are the central theme but it is meaty and ultimately savoury on the finish. Grant Dodd, Australian Golf Digest, June 2008. Grant Dodd, Wining Pro website, May 2008. Purple/black in colour, it has a brooding bouquet of smoke, spice box, blueberry, blackberry and chocolate. Medium to full-bodied, the wine is remarkably opulent for its humble price, with thick, ripe black fruit flavours, admirable balance, and a 40- second finish. 89 pts – Robert Parker, Jr. #173 Purple-coloured, the wine offers lots of spice, forest floor, truffle, and kirsch in its expressive aromatics. Supple and sweet on the palate, the wine is seamless and easy to drink. With good balance and a pure finish, the wine should effortlessly provide pleasure over the next 8-10 years. 92 pts – Robert Parker, Jr. #173 Purple-coloured, it exhibits an attractive perfume of violets, lavender, pepper, smoked meat, and blueberry. Plush on the palate and medium to full-bodied, the wine has gobs of savoury flavour and well-integrated components.